Herman Lynn “Butch” Schueling, 66, passed away peacefully, surrounded by family on Monday, January 21, 2019 in a San Antonio hospital following an extended illness. He was born November 27, 1952, in Hondo, Texas to Herman B. and Audrey (Reese) Schueling. On February 22, 1975, Butch married his beautiful bride of 43 years, Doris Marie Wurzbach Schueling. Together they raised their daughter and two sons. He was a proud owner and operated his family construction business since 1977, “Schueling and Sons Conservation Service LLC”. As a lifelong resident of Hondo, he was involved in various activities in the community and in the county. He was an active member of the Hondo Band Boosters, EMS Board, the church council and youth leader at Zion Lutheran Church, and he helped coach his daughter and sons Little League softball and baseball teams. Butch joined the Hondo Volunteer Fire Department back in January of 1982, and he served as Fire Chief of the department for 14 years.He loved to fish, hunt, ride horses and rope. Butch is preceded in death by his parents and a sister-in-law, Terry Carle Schueling. Butch was a loving father and grandfather and a mentor and friend to many. 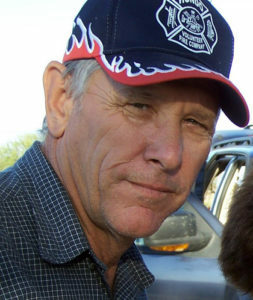 He was survived by his wife, Doris Schueling of Hondo; daughter and son-in-law, Shaunna and Gable Martinez of George West; two sons and daughters-in-law, Gaylon and Farrah Schueling of Hondo and Jonathon and Theresa Schueling of D’Hanis; eight grandchildren, Reilly, Raquel and Rebecca Martinez and Reese, Erin, Harper, Jacob and Grayson Schueling; brothers and sister-in-law, Tommy Schueling of D’Hanis and Terry and Barbara Schueling of Yancey; sister and brother-in-law, Lana and Bill Burk of Yancey, and several nieces and nephews. Serving as Honorary pallbearers are the members of the Hondo Volunteer Fire Company. Visitation was Thursday, January 24, 2019 starting at 5:00 pm at Tondre-Guinn Funeral Home, with a Prayer Service that evening at 7:00 pm. A Memorial Service was held Friday, January 25, 2019 at 10:00 am at Zion Lutheran Church in Castroville, Texas. Services concluded with a reception. Memorials may be given in Butch’s memory to the American Kidney Fund or the Zion Lutheran Church.